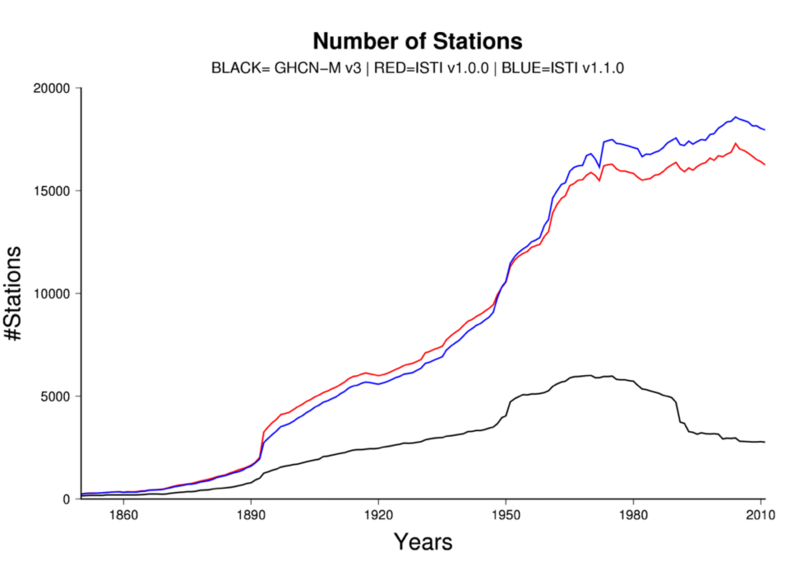 Station count of v1.1.0 of the ISTI databank from 1850-2014 compared to version 1.0.0 and NOAA’s current operational product, GHCN-M version 3.3.0. Assessing the state of the climate and how it is changing over time requires accurate, reliable data with widespread geographic coverage over long periods of time. Decision makers also require accessible, transparent information about the provenance of the data. NCICS is supporting two important efforts to better meet those needs by providing a more robust global temperature record: the International Surface Temperature Initiative (ISTI) and the development of a new version of NOAA’s Global Historical Climatology Network–Monthly (GHCN-M) land surface temperature record. The International Surface Temperature Initiative, developed in 2010, has been working to construct a new merged monthly land surface temperature databank. Three years in the making and derived from more than 32,000 stations—some with data going back 300 years—the first version of the new databank was released in June of 2014. It provides an improved picture of how land surface temperatures have evolved over decades and centuries. The databank is hosted here at NOAA’s National Centers for Environmental Information, is freely available along with the code used to generate the “Stage 3” merged product. Efforts are underway to continue expanding the number of data sources, provide products at higher time-resolutions, and to develop methods for benchmarking the data. An updated Version 1.1.0 was released in October 2015. Jared is also working on the new “Version 4” of NOAA’s Global Historical Climatology Network–Monthly, which will be based on the ISTI databank. In addition to benefiting from significantly expanded coverage, GHCN-M v4 uses updated ingest and quality control procedures and an improved algorithm for removing non-climatic influences in the data. In October of 2015, GHCN-M version 4 was released as a public beta (known as v4.b.1). Changes based on user feedback are being incorporated into the processes, and work is underway to finalize the operational structure, provide documentation on the product, and produce a journal article that will be published along with the official data release.